In the future, when a major industrial accident occurs due to a failure to follow safety measures, the main contractor, as well as the subcontractor, will be subject to a maximum of 7 years in prison or a fine of up to 100 million won. A new bill will also have the main contractor, which caused the serious industrial accident, receive disadvantages when bidding for construction contracts, and protect emotional laborers such as the employees working at call centers from industrial accidents. On August 17, the government accepted the “Measures to Prevent Serious Industrial Accidents” including these details at a meeting to review and adjust current state tasks chaired by Prime Minister Lee Nak-yeon. Major industrial accidents were defined as work sites where a fatal accident occurred or accidents where two or more people suffered injuries requiring more than three months of treatment and where more than ten people were simultaneously injured. The Ministry of Employment and Labor will draw up amendments to the Occupational Safety and Health Act to include these details and submit the bill to the National Assembly next March. The government plans to enforce the revised bill in the second half of next year. The main contractor’s responsibility and punishment for industrial accidents will be strengthened to prevent the “outsourcing” of danger. In the past, the main contractor was subject to up to a year in prison or a fine of less than 10 million won for not adhering to safety measures when a major industrial accident occurred, but punishment will be strengthened, and the main contractor will now be subject to the same punishment as the subcontractors. Until now the main contractor was only responsible for the operations carried out in sites designated as “dangerous,” but now the contractors will be responsible for industrial accidents that occur in all sites. The latest government measure will have the main contractor personally handle operations that deal with particularly high levels of toxicity or danger, such as refining mercury, handling of heavy metals, and plating. As for tower cranes and railway sites, where a series of major accidents had occurred recently, the government plans to draw up guidelines to strengthen inspection standards and to adjust train hours during operations. The government will also draw up a bill to protect workers engaging in emotional labor, such as the staff at call centers, from industrial hazards. In addition, the government will also make it mandatory for businesses to provide protective gear and safety education for workers in special forms, such as the workers in motorcycle parcel delivery or food delivery. Businesses that fail to follow such regulations will be punished with up to five years in prison or a fine of up to 50 million won. After a series of deaths of migrant workers who worked cleaning the septic tank of a rural pig farm, people are raising their voices calling for the government to protect the rights of laborers and prevent industrial accidents. Labor and social NGOs such as the Migrants’ Trade Union held a press conference in front of the government office in Seoul on June 4 and announced, “Every year, an average of 2.8 migrant workers died after suffocating in the septic tanks, but this year, four have already died.” There are a million migrant workers in Korea, but the continuing human rights violations and labor exploitation is an international disgrace and a shameful portrait of South Korean society. The reliance on foreign labor in South Korea’s agricultural and livestock sector as well as the so-called “3D” manufacturing industry concerning dirty, difficult and dangerous tasks is growing. Nevertheless, the migrant workers working in the agricultural and livestock sector continue to suffer human rights violations, such as physical and verbal abuse, and they are forced to endure harsh working conditions. The death of four migrant workers at a pig farm last month is also connected to such background. On May 12, two Nepalese workers suffocated and died while cleaning a septic tank at a pig farm in Gunwi, Gyeongsangbuk-do. The suction machine for the excrements broke down and the workers manually cleaned the tank without any safety equipment such as masks, eventually dying from the toxic gas. Also on May 27, a Chinese worker in his sixties and a Thai worker in his thirties also lost consciousness while cleaning the excrements at a pig farm in Buknae-myeon, Yeoju-si, Gyeonggi-do. They were moved to a hospital, but later died. Migrant workers working in the rural areas are “excluded” from provisions pertaining to working hours and holidays according to Article 63 of the Labor Standards Act. They cannot properly receive overdue wages as well as leaves and overtime pay. This is why people are calling migrant workers the modern-day serf, and joke that their workdays are Monday, Tuesday, Wednesday, Thursday, Friday, Friday, and Friday. In particular, the Act on the Employment, Etc. of Foreign Workers (Employment Permit System) restricts the migrant workers’ freedom of occupation, because it limits the number of times and the time to change work places. In particular, workers who entered the country with a work visa in the agriculture and livestock sector are banned from finding employment in the manufacturing and service industries, which have relatively more jobs. TV show that shares challenges and sorrows of young people preparing for a (barely) secure job, and one who produced it killed himself suffering cruel working environment and labor exploitation. The death of a rookie producer of the tvN drama Drinking Solo may have been the result of an excessive work load, personal insults, and the authoritarian culture in the company. 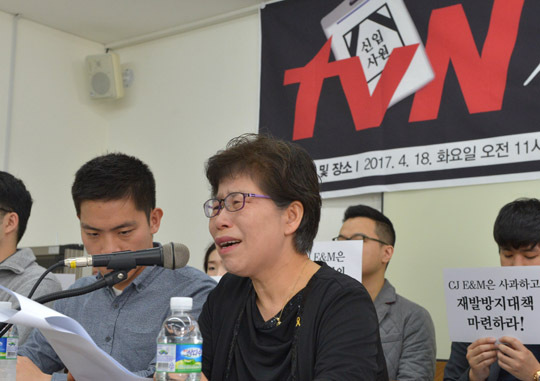 The Youth Union and the bereaved family members formed a “committee to resolve the death of the rookie assistant producer of Drinking Solo.” The committee held a press conference on April 18 and demanded that the broadcasting company release the investigation results of the suicide of Lee Han-bit, who died last year, along with an apology and measures to prevent recurrence. On October 26, 2016, Lee Han-bit (27 at the time), a rookie producer at tvN, a cable channel owned by CJ E&M, was found dead five days after he had gone missing. Lee joined the company in January 2016 and was assigned to the production of Drinking Solo in April. Drinking Solo is a TV drama about the challenges and sorrows of young people preparing for the civil service examination in Noryangjin, Seoul. At the time, the company said that Lee died due to personal issues. However, when the committee analyzed the conversations on Lee’s KakaoTalk account and his phone calls and interviewed the employees of the partner companies related to the show, the results pointed in another direction. Lee had to oversee various tasks including costumes and props, and he had to organize the set and settle the account. According to his phone records, he was able to take a break for only two days from August 27, 2016 when the shooting resumed until October 20, the day before he was reported missing. During that period, he had made 1,547 calls and is estimated to have slept an average of 4-5 hours a day. Lee also struggled after he was in charge of laying off temporary staff. In his suicide note, he wrote, “The words ‘labor exploitation,’ which the staff mentioned half jokingly, dug into my heart. To them, I’m nothing more than a manager who squeezes out the workers.” The verbal abuse within the production team was also serious. The recordings and KakaoTalk conversations Lee left behind show that the others frequently slandered and spoke profanity towards Lee when having a company dinner or talking in the group chat room. A female worker‘s infertility has been recognized as an industrial accident for the first time in South Korean history. The decision recognizing the worker’s infertility as an “occupational disease” was significant in coming amid widespread attention to the protection of mothers in response to South Korea’s low birth rate, as well as growing interest in the use of reproduction-toxic substances in workplaces. The Korea Workers’ Compensation & Welfare Service (K-COMWEL) announced on Mar. 19 that it had granted the request of a 39-year-old surnamed Kim to have her infertility recognized as an occupational disease and treatment benefits paid. Kim worked for 15 years in a production position at a Samsung semiconductors factory in Giheung, Gyeonggi Province. Used in semiconductor plants as a cleaning solution, ethylene glycol is classified as a reproduction-toxic substance that causes birth defects. While infertility and miscarriages were cited as potentially subject to compensation in a 2015 recommendation by the Samsung occupational disease mediation committee, they have not been included in the standards of the company‘s independently formed compensation committee. Reproduction-toxic substances, or substances with harmful effects on reproduction functions and capabilities and embryo generation and development, have been seen as causing far-reaching damages, as they not only affect the individual suffering exposure but can also cause health problems in the next generation. According to Korea Occupational Safety and Health Agency (KOSHA) data, a 2014 working environment survey counted 33,828 female workers with a high risk of exposure to reproduction-toxic factors at workplaces with five or more employees. The number accounted for 6.78% of the 499,194 total female workers in production positions. By occupation, the highest totals were found in leather, handbag, and shoe manufacturing, followed by electronics, textile manufacturing, and food manufacturing. A Dec. 2016 report published by the National Human Rights Commission of Korea from a survey on the human rights of workers handling reproduction-toxic substances showed 27% of 406 female nurses who had handled such substances as having experienced difficulty conceiving; 22.8% as having experienced premature birth, stillbirth, or miscarriage; and 20.2% of having experienced menstrual irregularities. While the stillbirth and miscarriage rate was 13.9% for female workers enrolled in health insurance through their workplace between 2007 and 2015, an analysis for manufacturing in particular found high rates of 16.6% and 16.2% for timber, lumber products, and furniture manufacturing and for rubber and plastic manufacturing, respectively. Around one-quarter of South Korean wage earners are engaged in low-wage work, a percentage that has remained virtually unchanged with just a 0.5 percentage point drop in the past 10 years, a study shows.South Korea’s public and social welfare expenditures were also found to be just half the average for OECD member countries. The Ministry of Health and Welfare announced the findings as part of a report titled “Social Security Viewed through Statistics 2016” published on Mar. 2. The social security statistics consist of 162 representative indicators in areas such as family, health, work, employment security, poverty, and environment. The findings published on Mar. 2 showed 23.7% of workers in low-wage jobs, the third highest rate in the OECD after Ireland the US. The indicator is a representation of wage inequality, with higher percentages of low-wage workers signifying not only labor market inequality but a greater likely of working poverty.The category of low-wage workers includes those earning less than two-thirds the median salary for all wage earners. By 2014 standards, it represented an hourly wage below 6,712 won (US$5.84), or approximately 1.4 million won (US$1,220) per month. The rate of low-wage employment was far higher for women than men by a margin of 37.8% to 15.4% – a number attributable to the large percentage of female workers in low-income industries such as hospitality and restaurants or in irregular positions. The percentage of workers in low-wage jobs was also down by only 0.5 percentage points from the 24.2% recorded in 2004, indicating almost no improvement in the preceding decade. South Korea’s public and social welfare spending was found to remain at a low level. In 2014, South Korea spent 10.4% of GDP on public and social welfare, or roughly half the 21% average for the OECD’s 30 member countries.At the same time, the Ministry of Health and Welfare noted, “While the OECD average increased by 0.98% a year from 2000 to 2016, South Korea’s annual rate of increase in public and social welfare spending over the same period was high at 5.4%.”The rate of national Basic Livelihood Benefits payment was calculated at 3.2% for 2015, with 16,460,000 beneficiaries. The rate showed almost no increase from 2001, when it stood at 3%. 8 methanol poisoning accidents identified during last 2 years. Who is responsible and who can make them responsible? SEOUL, South Korea, October 17, 2016 – According to Solidarity for Workers` Health (here in after SWH), two more occupational accidents related to methanol poisoning were recently reported in the SAMSUNG Electronics’ supply chain. A 29-year-old male worker surnamed Kim who was dispatched to DuckyongENG, a subcontractor for SAMSUNG, showed signs of blindness on February 24, 2015. Also, on January 16, 2016, another 35-year-old male worker surnamed Cheon working for BKTech, which is also a subcontractor for SAMSUNG, showed the symptoms of blindness on the way back home from work. He was taken to a nearby hospital on the following day, however he lost his sight in his right eye, and most vision in his left eye. Both of the victims have only recently realized that their accidents are deeply concerned with the methanol poisoning, thus decided to report their cases to SWH. Methanol can cause headaches, nausea, vomiting, sight loss and even death. Ethanol is recommended over methanol because it is less toxic, but ethanol costs three times more. Both of the workers were responsible for the process related to CNC equipment. The CNC (Computerized Numerical Control) machine is a tool capable of processing and scaling metal materials to a previously input value. The CNC equipment used by the victims is a cutting tool that cuts according to previously input levels. The machine maintains refined control while carving aluminum metal, thus, was used to produce a large amount of mobile phone parts. Both of the victims worked in the process of producing mobile phone parts using the aforementioned CNC equipment; methanol was used as cutting oil in this machinery. The cutting oil was used when cutting metal materials, to have the blade cooled and lubricated so as to remain clean and, thus, extend the life of the machine overall. The CNC equipment used by the victims had a hose that automatically sprayed the cutting oil to the blade. As a result, a high concentration (99.9%) of methanol was continuously sprayed while the machine was in operation. Including these newly reported 2 cases aforementioned, up to date a total of 8 methanol poisoning accidents which were concerned with CNC process in the electronic industry supply chain have been identified to the public. All of these accidents occurred during the past two years. According to industrial health doctors, this is unprecedented; they are saying that these kinds of occupational accidents like the methanol poisoning had been disappeared long ago in the early 20th Century. What is even more shocking is that there remains high possibility that more victims who might be diagnosed with acute methanol poisoning caused by the exposure while working in the CNC process have not been identified yet.When a series of accidents occurred in February, 2016, the Ministry of Employment and Labor conducted an inspection over all the factories in which methanol was used. After the inspection, the Ministry announced that there is no more poisoning case in the workplace. However, these accidents aforementioned have not been identified by the Ministry at that time, which shows that the announcement is unreliable. Also, according to Kim, one of his colleagues also having trouble with the eye vison did not report his case to the Ministry. SAMSUNG, a prime contractor should take the responsibility for the methanol poisoning in its supply chain. treatment methods for methanol. The workers neither received notifications of the substance’s danger nor had on-board orientation regarding the danger of their work. In addition, the workers never saw a Material Safety Data Sheet (MSDS) during the course of their employment. NGOs argue that SAMSUNG, a prime contractor should take the responsibility for the methanol poisoning in its entire supply chain. Specifically, they urge SAMSUNG should directly monitor not only the first tier subcontractors but also the second and third tier ones. However, SAMSUNG has not officially assumed any responsibility for the occupational injuries of its subcontract workers. So far, SAMSUNG does not recognize the responsibility to directly monitor its second and third tier subcontractors, saying that it is ‘impossible’ for prime contractors to inspect all subcontractors, because there are too many. Moreover, SAMSUNG insists that it is capable of monitoring only first tier subcontractors, whom they have a direct contract, not subcontractors behind the first tier. This argument obviously goes against what the UN Guiding Principle on Business and Human Rights (hereinafter UNGP) and the OECD Guidelines for Multinational Enterprises say about the responsibility of prime contractors in the supply chain. The right to work in a safe environment is fundamental and significant, which should be enjoyed by all workers irrespective of the tier of their workplace in the supply chain or whether they are directly employed or dispatched. Victims and NGOs have already submitted the LETTER OF ALLEGATION to the UN Working Group on Business and Human Rights last June, arguing that SAMSUNG, one of the respondents, has abandoned its responsibility of monitoring the violations of occupational safety and health stemming from its subcontractors beyond the second tier in the supply chain, which constitutes the violation of the UNGP. NGOs are going to provide updated information about the two newly identified accidents to the UNWorking Group. …”Since it is tricky to quantify performance at hospitals, workers say they will be measured based on medical fees they generate, which will motivate them to make patients undergo unnecessary tests and treatments. They could also charge fees for services which were originally free, or buy low quality medical supplies in order to reduce costs, which will negatively affect patients. South Korean authorities let Samsung withhold from sick workers and their families crucial information about the chemicals they are exposed to at its computer chip and display factories, an Associated Press investigation has found. A worker-safety group has documented more than 200 cases of serious illnesses, including leukaemia, lupus, lymphoma and multiple sclerosis, among former Samsung semiconductor and LCD workers. Seventy-six have died, most in their 20s and 30s. It is extremely difficult for workers to get compensation for occupational diseases from the South Korean government, and without details of their exposure to toxins in their workplaces it is almost impossible. “In a situation where people’s lives are at stake, [Samsung] brought uninformed kids from the countryside and acted like money is everything, using them as if they were disposable cups,” said Park Min-Sook, 43, a former Samsung chip worker and breast cancer survivor. Hwang Sang-Gi, father of Hwang Yu-mi, a former Samsung factory worker who died of leukaemia aged 22, told the AP that the company once offered him 1 billion won ($914,000) in exchange for his silence. “The idea was to deny her illness was an occupational disease and to leave me without any power to fight back,” said Hwang, who launched a movement seeking independent inspections of Samsung factories. Since 2008, 56 workers have applied for occupational safety compensation from the government. Only 10 have won compensation, most after years of court battles. Half of the other 46 claims were rejected and half remain under review. People who have claimed that they became ill because of work they did for other major South Korean manufacturers, including Hyundai Motor, have received help from their unions in advancing their claims. Hyundai Motor now must get union approval before introducing new chemicals into its manufacturing processes. Samsung’s workforce is not unionised. In at least six cases involving 10 workers, the justification for withholding information was the protection of trade secrets. Court documents and interviews with government officials, workers’ lawyers and their families show that Samsung often cites the need to guard trade secrets when it asks government officials not to release such data. “Our fight is often against trade secrets. 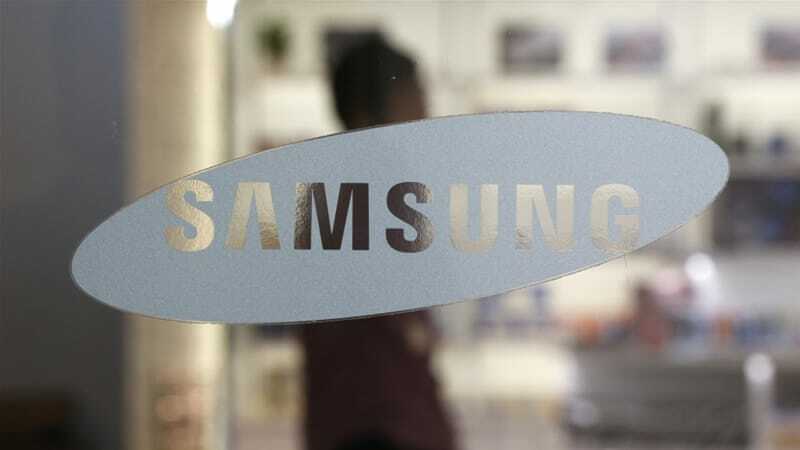 Any contents that may not work in Samsung’s favour were deleted as trade secrets,” said Lim Ja-woon, a lawyer who has represented 15 sick Samsung workers. Lim’s clients have been unable to get access to full reports on facility inspections, which are produced by third parties to comply with South Korean law, but remain the property of Samsung. Only excerpts of some independent inspections can be found in some court rulings, he said. South Korea law bars governments and public agencies from withholding corporate information needed “to protect the lives, physical safety, and health” of individuals on the grounds of trade secrets, but there are no penalties for violations. Lim said that the law on occupational disease compensation also obligates Samsung to give workers the data they need to make claims. Government officials openly say corporate interests take priority, that evaluating trade-secrets claims is difficult, and that they fear being sued for sharing data against a company’s will. Asked why he used the word “clients” to describe companies his government agency helps regulate, Yang said it’s probably because he treats those companies “as I treat clients”. He said the companies KOSHA evaluates also review the agency, and the finance ministry considers those reviews when it sets agency budgets. When asked for comment, Samsung issued a statement to the AP saying it never “intentionally” blocked workers from accessing information and that it is transparent about all chemicals it is required to disclose. It also said there was no case where information disclosure was “illegally prevented”. However, documents from courts and the labour ministry show that as recently as last year, Samsung asked the government not to disclose details of chemical exposure levels and other inspections – even at the request of judges for use in workers’ compensation lawsuits. Although the company no longer omits lists of chemicals as it did in Hwang Yu-mi’s case, it has recently withheld details about exposure levels and how its chemicals are managed. Samsung states on its website that its chemical management system is “rigorous” and “state-of-the art”. It has had “real-time, 24/7 chemical monitoring” in all facilities since 2007, the year the government began inquiries into Yu-mi’s death. Yet Samsung began monitoring some toxic byproducts in the air only after a 2012 inspection detected benzene and formaldehyde – both known carcinogens – at its chip factories. Baik Soo-ha, a Samsung Electronics vice president, told the AP that Samsung has redacted trade secrets in documents given to individuals only when their requests appeared not “purely” meant to determine occupational diseases. “We have a right to protect our information from going to a third party,” he said. Baik did not elaborate on what sort of ulterior motives Samsung believes might be behind some requests. Renovating motel to hospital seems common practice in S.Korea thesedays. 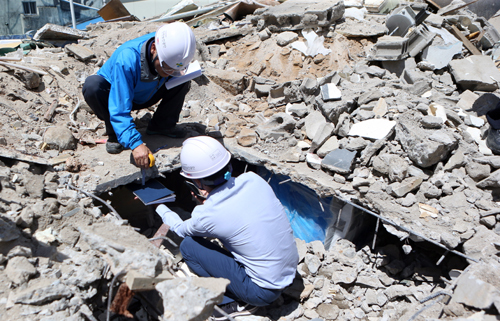 Two workers died and four were injured when the roof of a three-story building collapsed Sunday during renovation work in Jinju, South Gyeongsang Province, Monday. Three of the six workers were buried under the debris when the roof collapsed during work to transform the third floor from a motel to hospital offices. Two of the buried workers died, but one was found alive after a 14-hour rescue effort. 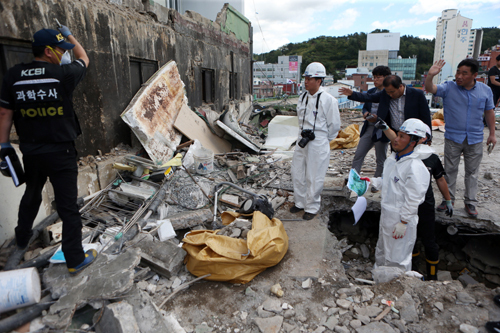 The building’s structure was too weak use heavy machinery in the rescue operation, and the number of workers assigned to the rescue had to be limited to 20 at a time to avoid a secondary collapse. Two of the workers were found to have been crushed to death by the debris. A third was found to have survived, having stepped outside to smoke against a wall minutes before the sudden cave-in, avoiding the direct impact of the fallen roof. The authorities suspect that the workers had unwittingly knocked down a wall that supported the roof, mistaking it for a non-supporting partition wall to separate motel rooms. 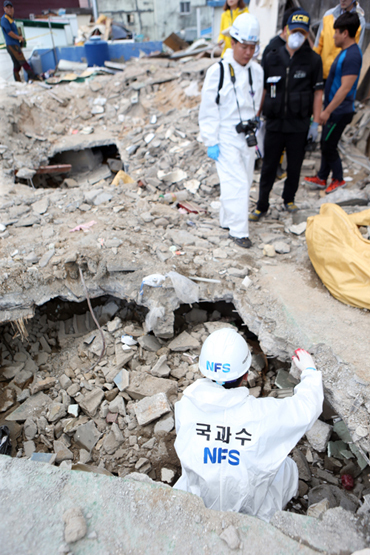 The mistake may have arisen partly because the building differed from typical Korean structures as it was built entirely of unreinforced brickwork, and blueprints of the original construction were missing, authorities said. The authorities plan to question whether there were any legal breaches in the reconstruction work. The first floor of the building is being used as a Chinese restaurant and the second floor is a hospital office area. The renovation had been intended to expand the hospital’s premises.